This topic has 59 replies, 12 voices, and was last updated 3 months ago by twowheels. 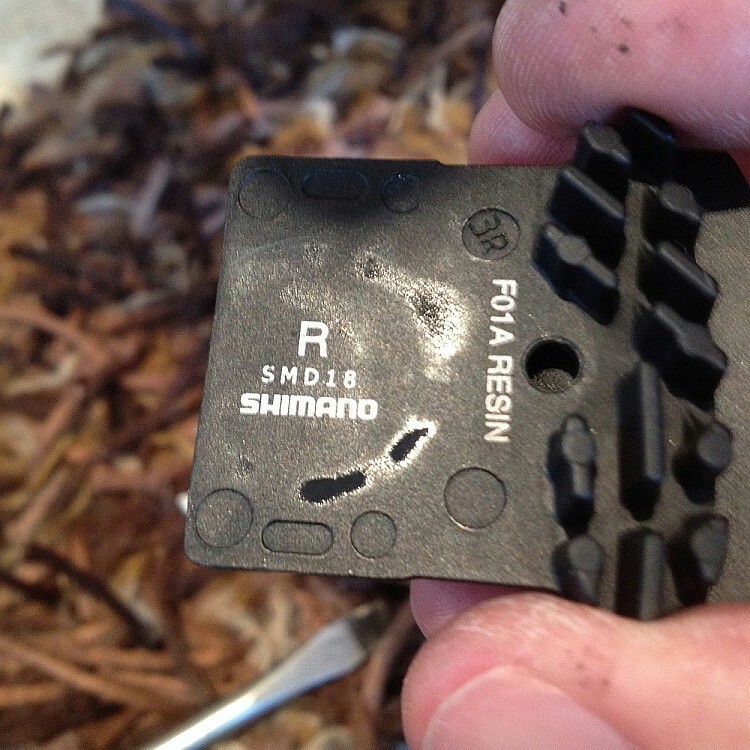 I think a few of you have posted over the last few years of leaking calipers from various Shimano brakes. For me it has been their RS785 road caliper, three calipers and counting replaced under warranty. My rear one is starting to go the same way again. The symptoms are a gradual loss of power and contamination of pads and discs. It is a very small leak, barely visible but still noticeable in small deposits of oil on the caliper. Along with many I thought it was the piston seals that were leaking and as there is no seal kits available not a serviceable part. My current caliper is out of warranty so I decided to do a quick Google search to see if there was any updates on this issue before I bought a new caliper. I found a post from a guy called Oliver Majewski who diagnoses the problem as a rubber o ring seal on the fluid transfer port. He says that if you replace the o ring with a slightly harder rubber compound it fixes the issue. I have ordered some new O-rings and will give it a try. Certainly from inspecting one of my previously failed calipers the deposit of oil is close to where the port is as opposed to the pistons. Worth a try before you junk your caliper. Easy to do, remove caliper, remove the securing bolts to split the caliper, replace o ring, re assemble. Might give that a try at some point on my slx brakes that have a similar problem. Make sure you get the correct material as well. Is anyone able to post a link to this page? I am failing miserably. Ordered replacement 785 calipers yesterday. Where did you get the correct size and type o rings from spangels? Second hit in google for me. Re o ring size had to measure them with calipers, however will wait until they arrive before I confirm they are right! Will let you know. Are they the same as the bleed port seal at the leaver? Okay after a bit of trial and error I have found the closest size but slightly thicker o rings. It is 3mm internal diameter and 1.5mm width. The original ones are 3mm 1.3mm. Will fit the modified caliper tomorrow and post if it works or pisses fluid everywhere. I’ve almost got my AWOL sorted now, it has RS785s and they are awful. I’m suspecting the same issue that you’ve seen. Hi not had a chance to put the caliper on the bike, hopefully get it done later today. That doesn’t change the transfer port o-ring though? Cured the leak completely, that’s what matters. This thread needs more ‘likes’. Aye DezB but not the type of leak that’s being discussed. Okay, so got the caliper fitted today. Brake bled with no issues, checked for leaks and none apparent. Cleaned the discs and sanded the pads and after a couple of bed in stops the brakes are working to full capacity with no more squealing. So the new o ring has done the job and only time will tell if it is better than the original one. I will keep the thread updated on how it is performing over the next month and post up if it fails in the next year or so. Can all shimano calipers be split to do this or is it only certain models? Had trouble previously bleeding some brakes, wandering if this could have sorted a possible issue with them? I would think as long as it is held together with bolts you should be able to split it. Not sure if they are all the same design inside and I think they may have differing o ring sizes though I could be wrong. Three weeks on and the o ring is holding. In the first week there was some squealing from the brakes but that was just some residual contamination. It has gone now and the brakes are stopping well with no issues. A cheap fix if you have the same issue. After a frustrating discussion in the LBS I’m not sure they will be willing to warranty the (probably) leaking calliper on my dad’s bike. Aaaaanyway, point being, has anyone with a problematic leaking caliper suffered from increasing lever travel, or is it just squealing/poor performance? If it’s a tiny leak, why would it necessarily lead to increased lever travel? I’ve certainly had cases where it feels perfectly normal at the lever, with contamination plenty and howling at the caliper. Can you clean them thoroughly, then wrap a bleed block with clean tissue and see if you can get it to piss some mineral oil out onto it by squeezing the lever repeatedly? My thoughts exactly Martin, was fairly sure a small enough leak would just behave like pad wear! Try doing it keeping the lever slightly squeezed/under pressure for a longer period, e.g. overnight. You could use a cable tie or a bungee cord wrapped around the grip and the lever several times to maintain the pressure on the lever. It isn’t always that seal though, we’ve seen several that have been leaking around the caliper piston seals themselves, so something to watch out for. I’ve had about 5 micro leaking deore callipers over the years, lever travel not affected and still feels solid. Interesting about the o-ring, I’ll bear that in mind for the inevitable next time. OK, I take it all back, not sure why I was so certain I had tested caliper for leaks, but took pads out this evening and they more or less had fluid running down the back of them! The inside of the caliper looked pretty gloopy also. As above…. I have had quite a few shimano calipers leak. I have taken a couple apart and examined the piston surfaces on a microscope and could clearly see a slight angled groove around the circumference of the piston from the square o ring seal. A lot of people don’t realise (I am sure you all do) that the pistons don’t actually slide through the seals under normal braking. They only slide when the pads wear and they need to advance further out the caliper. It’s the square o ring that deforms under pressure (and relaxes as the pressure is removed) . If the calipers are not perfectly aligned then the pistons and square o ring can develop accelerated wear due to uneven loading around the circumference of the piston. Had it happen to my m785s which use ceramic pistons and also deores which use ally pistons. Once the grooves develop the pads wear unevenly accelerating the problem further. I think the problem is worse the more worn the pads get and the further the piston needs to advance out of the caliper. I have had deores leak from the piston with worn pads, but fitted new ones and problem went away (not surprising as the seal was then running on an unworn surface). Not sure what the shop’s problem is with this one, we’ve sent loads of these back to Madison, and they’ve all been replaced/credited with no quibble at all (given the usual provisos of “proof of purchase needed”, and “2 week turnaround as very busy”). It’s a common problem, we’ve got no reason to argue over it, and just fit a new caliper from stock, then get it credited by Madison once their warranty department get to it. Agreed some people seem to be lucky but this does seem to be an extremely common problem not related to any particular level either (lx,deore,slx,xt etc)… Mind you I have not heard of the xtr’s going very often… Perhaps that has to do with the slightly tighter tolerances on the magnesium cast and machined caliper body. Either way madison should warranty without question and the lbs should not be arguing. Has anyone had/fixed this on Rs505 calipers? I’m having a nightmare with mine at the moment. The odd thing is that it gets better with riding. As soon as you get some heat into them they stop squealing and start working. But then leave the bike on the rack for a week or two and they’re squealing again. Similarly, attacking the pads with a heat gun sorts them out nicely, but the problem comes back without riding the bike. So I don’t know whether there’s fresh oil being leaked onto them, or whether the pads are soaked through and I’m only ever burning off the top layer and then it’s soaking back to the surface when left. The problem started with both brakes at exactly the same time which makes me suspect an external source of contamination rather than both developing a leak simultaneously. The odd thing is that it gets better with riding. As soon as you get some heat into them they stop squealing and start working. But then leave the bike on the rack for a week or two and they’re squealing again. ..that’s exactly what was happening with my R785 caliper, drag the brake down the first big hill to cook it and it was fine for the rest of the ride but it was squealing again if I didn’t ride it for a week or so. Never had an issue with increased lever travel but the back of the pads always looked like this..
Had the same calipers front and rear but it was only the the front that was the problem. After I’d replaced the pads a few times and decided it was nothing I was doing wrong, I went to my LBS who sorted a new caliper under warranty without question. Interesting – thanks for the info. Was out for a long ride today and checked the brakes afterwards, and absolutely no sign of a leak. Also tried wrapping some paper around a bleed block and giving it a good squeeze and again, no sign of leaks. I’d run out of ideas with the RS785 callipers on my Arkose, but took the plunge last night, pulled them apart and changed the fluid transfer port O-rings. The rear calliper had a lot of oil around the inside of it, which I think had been leaking from that point, as the back of the pads didn’t show and signs of the piston seals leaking. I get everything spotlessly clean when reassembling them, and fitted new G02A pads front and rear. 20 mile test ride today (including some careful bedding in) and they are the quietest they’ve ever been, with good power front and rear. Will report back after a couple more rides to confirm how they are holding up.